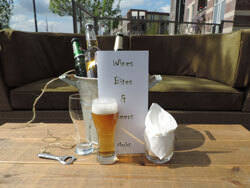 From 16:00 you are warmly welcome to join us for a splendid glass of wine, a speciality beer and delicious bites! These delights are served in our Lounge when the weather is poor and on our completely renewed terrace when the weather is fair: allow yourself to sit back and relax on one of our comfortable lounge sofas. On our Wines, Bites & Beers menu there are 25 wines that are served by the glass or half glass: sublime wines that often come from still relatively unknown regions – it would be our pleasure to take you on a tasting adventure! Our range of beers has also been considerably expanded: enjoy these beers from the “beer bucket”. And several beers come in alcohol-free versions. On the “Bites ” menu there are more than 15 types of finger food including : charcuterie met amazing salami, chorizo and matured hams. We have oysters , sardines and deep fried snacks as well.